This JAVA application is written for the Windows operating system and communicates with a GSM modem attached to one of the COM ports. At regular intervals it checks if new SMS messages have been received by the GSM module and verifies if the sender of the SMS is a listed and approved number (so it ignores ‘spam sms’). 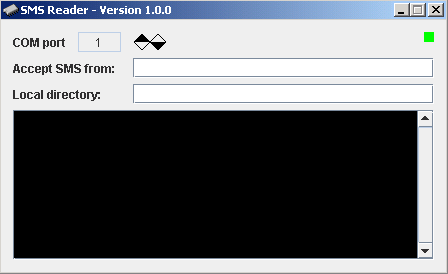 It will write the contents of the SMS to a local directory on the PC. The module was written for the Siemens MC35 module, the source code is provided in case different commands are needed for other GSM modems. The installer was build with Inno Setup installer and the configuration files are included.